The modern teacher: longshoreman or transportation engineer? As we have discussed in previous articles (HERE) or the TED Talk (HERE), the current educational system largely views students as commodities into which knowledge is poured; similar to industrial manufacturing processes. The fundamental structure of the current model is driven by an antiquated economic imperative based on the premise of scarcity of instructors and classrooms. This is no longer true. Also, the actual process of teaching occurs in a craftsman-like environment which has not changed for hundreds of years. As discussed in HERE, most industries start out with a craftsman-like model and then over time are optimized through continuous improvement processes and innovation. 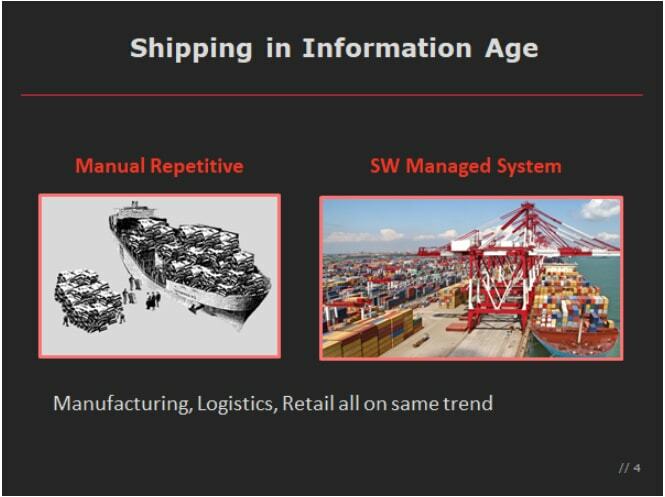 It is interesting to observe this transformation in the context of shipping -- and compare it to the education system. Fifty years ago, shipping was dominated by scenes reminiscent from classic movies such as “On the Waterfront," which featured longshoremen who provided the muscle to load and unload ships. This process required skill, strength and stamina. The work was difficult and in order to protect workers, a union was formed that focused on optimizing the longshoreman’s day. If we cut to modern times, the scene would consist of cranes moving containers from ship to trucks. The efficiency and cost having been improved by order-of-magnitude through the constant application of innovation, capital and process intellectual property. The whole process is now orchestrated by a transportation engineer. It is interesting to note that the bedrock rules/contracts in the longshoreman's world have no application today. Today, teachers across the world get up every day and proceed through a very manual process of developing the lecture, delivering the lecture and performing assessment day-after-day. There is very little automation available to teachers besides the textbook. Much like all craftsman models, the delivery to the students is highly variable in quality and consistency. However, with the use of technology, deeper investments in automation and an improvement in the teacher/student interaction model, a significant shift in capability is possible. In this world, the teacher operates in the role of the "transportation engineer" with easy access to powerful tools and with the ability to personalize the experience for every student.